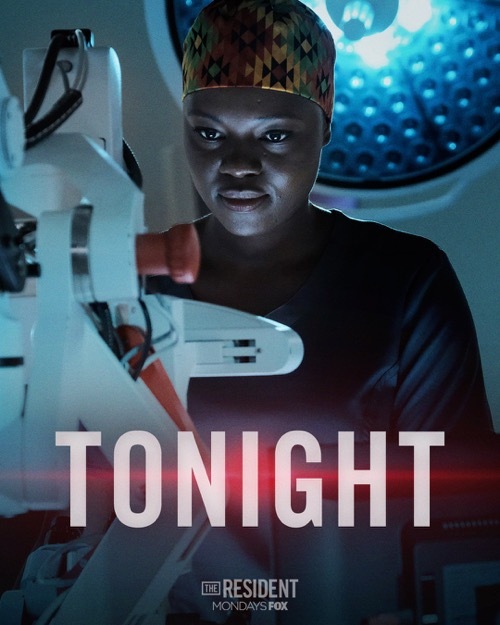 The Resident season 1 episode 10 airs at 9 PM – 10 PM ET on FOX. Make sure to bookmark this spot and come back for our The Resident recap! While you wait for the recap make sure to check out all our television recaps, news, spoilers & more! Conrad is running as he thinks about what Nic has told him about Lane. He thinks about Lilly and her death and how she pleaded with him for help. He begins running faster and faster. He runs right into a cyclist. He walks into work, dirty and limping. He sees an old medical teacher. He talks to her, asking her why she is here. She tells him she sees ghosts. Claire and Bell head out front to meet the famous Chinese diplomat, Mr. Zhou, that has come for surgery to be performed by Bell. Nic and Devon sit together in a room talking about Lilly. Nic is upset. She feels like it is all her fault. She begins crying. Conrad comes in. He tells her it wasn’t her fault. She gets up and leaves. Conrad walks Devon to see his new patient, his old teacher. Conrad walks to the pharmacy and asks for medication for a patient. He heads to a private room and injects his ankle with cortisone. Mena comes in. She is thrilled that Conrad’s old professor is here. She wants to meet her. Conrad sits with his professor. She tells him she sees all of the patients she couldn’t save. He tells her he would like to run some tests. She tells him she thinks she is losing her mind. Conrad, Nic and Devon meet with Claire and Lane. Lane cries. She cannot believe she wasn’t there. Claire wants to know what happened. Conrad thinks they need an autopsy to see if too much chemo was the cause. A colleague of Bell’s comes up to him. He knows he has been shaking. It is okay to admit he is getting older. Bell is in shock. He tells them it is between them. Nic is paged. She is ordered to go see Mr. Zhou. He is upset about the room number he was given in the VIP area. Nic asks him what a lucky number is. She retags his room #3333. Conrad introduces Mena to his professor. Mena tells her how much she admires her. Conrad tells her that her spinal tap and EEG came back normal. He thinks she might have a B12 deficiency. Nic wheels Zhou to surgery. Bell comes to meet them. Conrad’s teacher takes a walk down the hall. She sees another deceased patient. Bell comes into the OR to operate on Zhou. Meanwhile, Mena watches old operating footage of Conrad’s professor. In surgery, assisting Dr. Butler asks some questions about why Bell isn’t choosing to perform certain extras. Bell tells him there is no need. Conrad goes to see his professor. He finds out she is in the psych ward. He lies to the head nurse, telling her she has a brain bleed. He gets her out. Nic meets Mr. Zhou on the way out of surgery. Within seconds he begins to cough up blood. Claire is there. She wants to know what is going on. Nic pages another doctor. Claire wants to know why. Nic comments that they want the patient to live. Bell meets with the press. He gets a page. Zhou is brought back into surgery. Jude is trying to fix Bell’s mistake in the OR. Jude yells at Bell when he arrives in the OR. Jude cannot believe he made such a small mistake. He is supposed to be an experienced surgeon. Conrad brings his teacher for a walk outside. They talk about depression. He thinks she might be depressed. She tells him she has the right to be depressed. He tells her that isn’t true. She has so much to be happy about. She is an inspiration. In the OR, Jude apologizes to Bell after Mena warns him that Bell is still the chief. Bell takes the surgery over again. He reaches into the patient and says he feels a mass. He just saved the patient’s life. Outside of the OR, Bell tells Jude that his privileges to work at Chastain will be revoked. Conrad meets up with Mena. He needs her help. They go to see his professor. Mena asks if he could help rebalance an operating microscope. Devon approaches Conrad. He needs to treat him. He cannot hobble around the hospital like this. Devon tells Conrad he was a good doctor for Lily, better than Conrad was. And when Nic told them about Lane, he believed her, but Conrad didn’t. Mena and the professor look at the machine. The professor fixes it. Mena thanks her for that and for being her hero. Conrad watches on quietly from the side. Bell meets with Zhou who thanks him for saving his life. He gives him a 24 karat gold watch. The professor stays behind in the OR. She talks to her dead patients, telling them she did her best. They disappear. Jude comes to see Nic. He tells her he is done at Chastain. Outside, Conrad says goodbye to his professor. She tells him she knows he lost someone too. Lane comes in to see Bell. They get to talking. Lane thinks Claire is bad for the hospital and she makes $3 million a year. He would be better at running the hospital. They drink and then kiss. Jude tells Conrad he is leaving. He tells Conrad that Nic is hurting and he needs to make things better for her. Only he can. Conrad finds Nic in a dark empty patient’s room. She offers to give him a ride home. She helps him up the stairs to his apartment. She grabs supplies to wrap his ankle. They sit and she gets to work. He apologizes for not listening to her sooner about Lane. She gets up. He follows after her. This is his fault not hers. They hug and then begin kissing. They start to undress. Later, Conrad is sitting up in bed while Nic sleeps on him. He smiles. He sees Lily across the room.